This black and white photograph shows a parade moving along main street in Council Grove, Kansas. The event celebrated the centennial of the Santa Fe Trail. 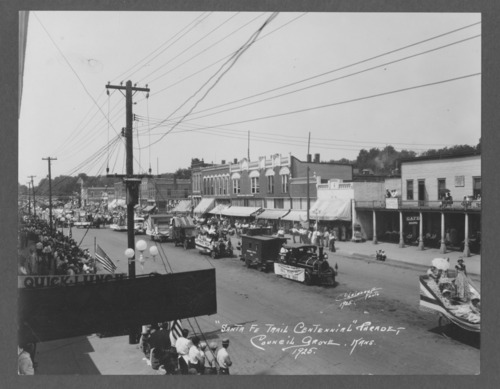 Numerous parade entries (motorized and horse drawn) are visible, including women on a float, a miniature locomotive and caboose containing Miss Kansas, etc. Business are also visible in the background. The Hays House/Tavern is the frame building with the balcony on the far right side of the photo. This business has had various names.